성장의 중요한 시기에 있는 아이들에게 먹는 음식은 다른 어떤 것보다도 중요한 것임에 틀림없다. 아이들의 지능과 신체를 고르게 발달시킬 수 있는 영양분은 어떤 것이며, 또 각각이 성장에 어떤 역할을 하는지, 그리고 아이들의 입맛에 맞게 맛깔스런 요리를 만들 수 있는 방법은 없는지 찾아본다. 연령에 따라 다른 요리법과 아침, 점심, 저녁, 간식 등으로 나누어 다양한 요리법을 제공한다. 특히 임산부가 지켜야 할 식이요법, 아이들에게 특히 해로운 음식의 종류도 찬찬히 설명하고 있다. Prepare delicious meals using the very best ingredients and introduce your child to healthy eating for life Super recipes Use over 160 simple easy to follow superfood recipes to creat tasty and satisfying meals that children will love. 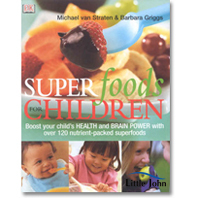 Super information Essential nutritional advice for each stage of your child's development - from birth to the teenage years. Super Kids Boost your child's health and brain power with the utimate top-tasting nutrious food - from big breakfasts and appetizing soups to fast-fix savoury snacks and mouth watering puddings.